Call The Aerial Guys today on 01772 382036 for a no obligation estimate and to arrange an appointment. 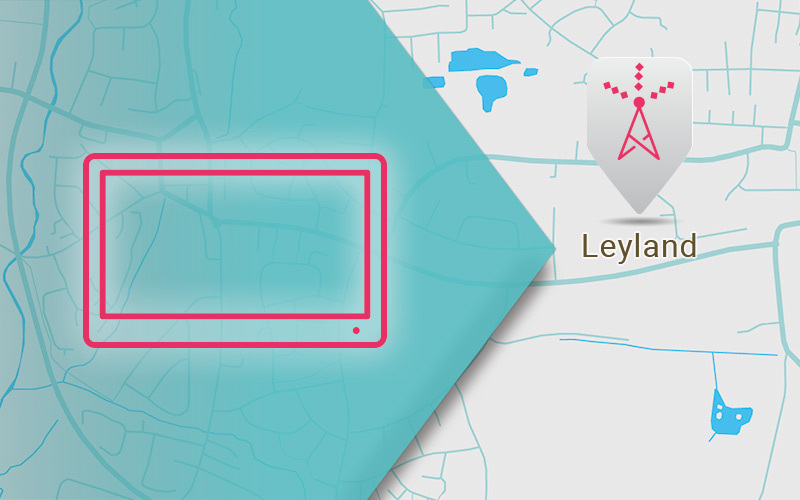 If you live in Leyland and are looking for local TV or satellite installation and repair experts, then call The Aerial Guys. We are passionate about providing you with the best possible service. Contact us today on 01772 382036 to book an appointment. At The Aerial Guys, our professional and approachable engineers will assess your TV aerial requirements as soon as we arrive, offering you an agreed fixed quote before any work starts, ensuring that there are no hidden costs. From TV aerial repairs in Leyland, to installing a new TV set-up, The Aerial Guys are always on hand to make sure you receive the best picture quality possible. If you need TV aerial repairs in Leyland, please don’t hesitate to call us. Why not speak to one of our technical advisers today, to find out how to arrange a visit from your local engineer in Leyland. Call us today on 01772 382036. At The Aerial Guys, we are also experts in satellite installation and satellite repairs in Leyland. If you’re looking for a complete satellite installation, then our engineers can install the entire system. We have specialist knowledge in all the main satellite services, including Sky, Freesat and European satellite installations. If you have concerns that your satellite signal is intermittently scrambled or pixelated then fear not, as The Aerial Guys are fully equipped to carry out full satellite repairs in Leyland and the surrounding area. Our professional engineers always carry a wide range of equipment suitable for all the main satellite brands, which means that we can usually fix the problem as soon as we arrive. Arrange your visit today on 01772 382036. With an extensive network of The Aerial Guys engineers working throughout the North of England, we can always promise an engineer is available to visit your Leyland home, usually the very same day. We have an extensive knowledge about TV aerials, after mending countless TV aerial installations in Leyland over the years. This means we really do know our business better than anyone. And, unlike some of the larger companies, at The Aerial Guys we always guarantee to deliver a trustworthy, local service that you can rely on for you TV aerial installations. So, if you live in the Leyland area, and need a local satellite repair service, make sure you speak to The Aerial Guys today on 01772 382036, for a professional, affordable service. If you are unsure whether your chosen wall is suitable for a TV wall mounting, then always seek expert advice from a professional tradesman. The first thing you need to do is establish if you have brick, concrete, breeze block or partition wall with plasterboard and stud work. All of our TV wall brackets and monitor wall brackets are designed to fit all these types of walls. Mary lives with her husband in a remote part of Leyland. “We didn’t think we’d be able to get a satellite system to work where we lived but we had a bit of a windfall and decided to spend it on a new TV. We didn’t know who could help us really, until our daughter told us about The Aerial Guys. I was a bit wary of the cost of having a whole satellites system installed, but the technical adviser at The Aerial Guys was very reassuring. “When we got the quote, The Aerial Guys told us that they wouldn’t start any work until we said it was OK. I liked the fact that they were straight down the line with all the money side of it. And the engineer that fixed the system was amazing. How he knew how to put everything together – well, I know I couldn’t do it. We are up and running now and so happy with our new system. The Aerial Guys were so good. I’ll definitely be using their aftersales service too – if we need it that is!” Mary says.